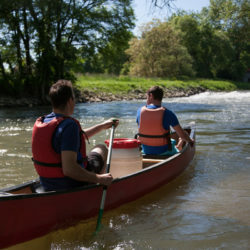 Our minibus will collect you from our nautical base in Sélestat (spacious car park) and transport you to the starting point of your canoe trip. Your day will end back at our base, which means no time wasted on your return, since your means of transport is already at the arrival point. Our infrastructure is accessible to persons with reduced mobility and we can, if necessary, modify our itineraries to allow them to participate in the trip. 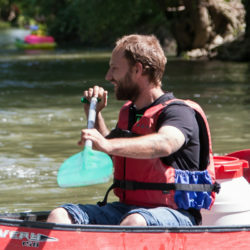 Our minibus, our boats and all our minor material are perfectly maintained for your comfort and safety. Every piece of equipment is disinfected on a daily basis after each return. Whether it’s in the spirit of a trapper or in an all comfort Indian camp, the choice is entirely yours. 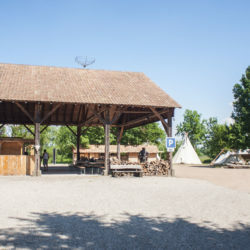 We offer you original accommodation such as tipis and Canadian tents… for an unforgettable experience. It is possible to have an on-site barbecue in the evening. Book the nautical base for a private function or reserve one of our packages. 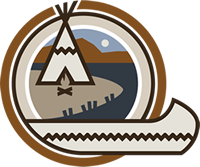 Accommodation is possible in a tipi or Canadian tent. Up to 36 people can be accommodated in one area and 54 people can be accommodated if both areas are merged together. A catering service is proposed (local partnership) for groups of more than 15-20 people. We are committed to making your itinerary as safe and easy as possible. We give you a safety briefing and instruct you on how to avoid disturbing the local fauna and flora. We have developed a network of local restaurants where you can stop off for a bite to eat. On the left bank: « A la truite » restaurant in Illhaeusern. The aperitif is on the house. On the right bank: « Auberge de l’Ill » gourmet restaurant in Illhaeusern.